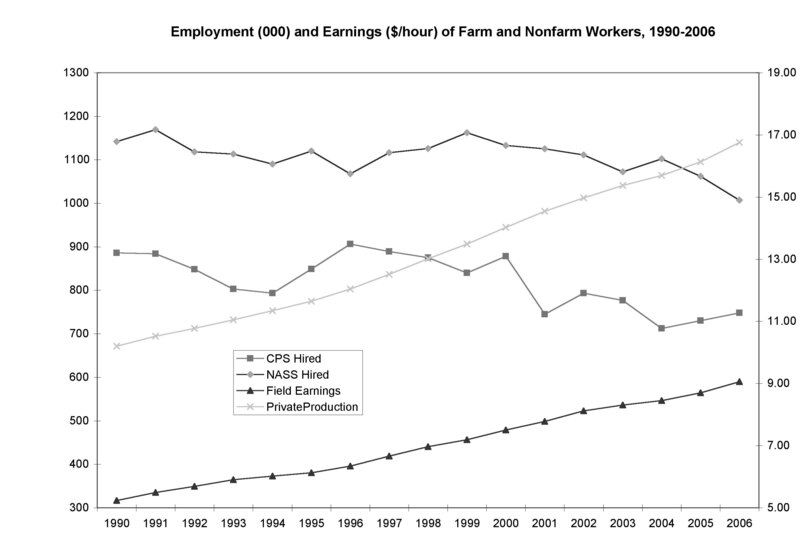 Many farm employers complain of labor shortages. There is no official government definition of labor shortage, nor is there an economic definition, as changing prices and wages are expected to bring supply and demand into balance. One labor shortage definition offered to assess labor shortage claims in the high-tech sector is employment rising faster than average and hourly earnings rising faster than average. The employment of hired workers fell during the 1990s, whether measured by the CPS, a household survey, or NASS, an employer survey. The average hourly earnings of field workers, as reported by employers, rose from $5.23 in 1990 to $9.06 in 2006, a 66 percent increase that slightly exceeded the 58 percent increase for production workers in nonfarm jobs.